Lotus Boutique is an independent, family-run women’s boutique on Boonton, NJ’s bustling main street. They specialize in contemporary, unique clothing that is suitable for women of all ages. Bridget Connor has owned Lotus since 2004 is inspired by her experiences shopping in small, local boutiques in Amsterdam and Portland, Oregon. Bridget handpicks each item and focuses on designs that are feminine, detailed, classically trendy and have a great fit. 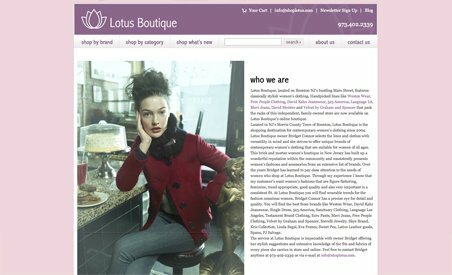 Lotus Boutique is an independent, family-run women’s boutique on Boonton, NJ’s bustling main street. They specialize in contemporary, unique clothing that is suitable for women of all ages. Bridget Connor has owned Lotus since 2004 is inspired by her experiences shopping in small, local boutiques in Amsterdam and Portland, Oregon. Bridget handpicks each item and focuses on designs that are feminine, detailed, classically trendy and have a great fit. Because she knows her inventory so well, Bridget is an expert at providing stylish suggestions and information on the fit and fabric of each item. After so many years of running her business, Bridget is excited to take her Boutique to the web.